Do you enjoy listening to audiobooks or are you a hard line advocate of the printed word? I’m a devoted fan of both and usually have one of each going all the time. 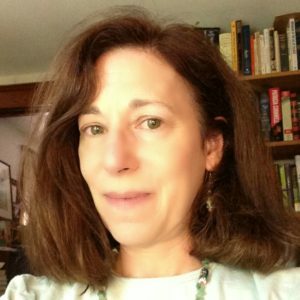 As guest blogger on June 1, Candace Levy will tell us why she loves audiobooks and why, if you’ve never listened to one, you really should give them a try. Levy is a full-time freelance book editor whose clients include both major publishing firms and prominent independent presses. She is also a freelance book reviewer and journalist, covering books in a wide range of genres. When she’s not at her desk, you’ll inevitably find her listening to an audiobook while cooking, walking, making lace, or taking photographs. She was honored to be the Audio Publisher Association’s Audiobook Blogger of the year for 2016. To keep track of all her bookish adventures, follow her on Twitter (@BethFishReads) or visit her blog, Beth Fish Reads.